So, let’s get into who will be taking the field. Seeing as LAFC haven’t played a competitive game yet and the ASA dataset is restricted to MLS, this will mainly focus on their core who've seen gametime in MLS. LAFC sent allocation money to get SKC’s playmaker in Benny Feilhaber, who put in solid numbers with 6.36 xG, 5.45 xA, and 4.86 xB. Feilhaber is a well-rounded box-to-box midfielder with plenty of MLS and USMNT experience who will contribute to the Black and Gold in terms of goals, assists, and pulling strings in the buildup play. Benny’s former teammate Latif Blessing will be joining LAFC from the Expansion Draft. The speedy and small winger contributed 6.53 xG in 1,521 minutes. The below 2017 passing map gives some insight into what areas Feilhaber gives the ball to Blessing. 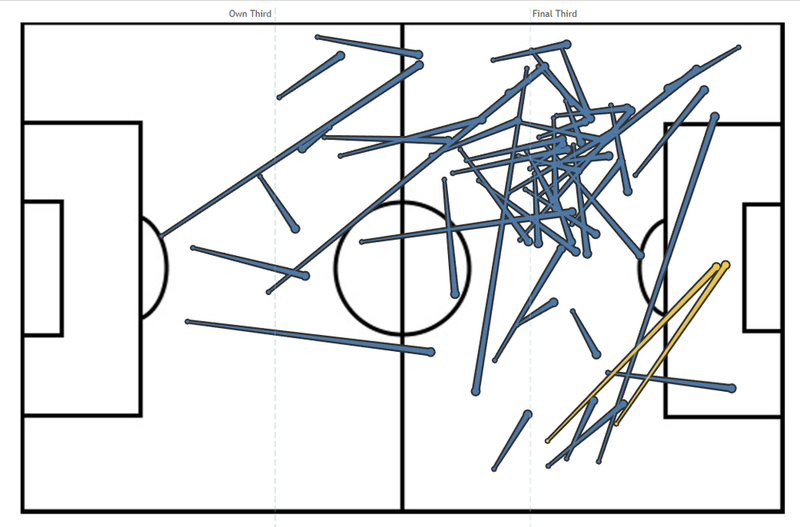 Last year at SKC, Benny completed 54 passes to Blessing with 39 of them ending in the final third, showing that the box-to-box midfielder can get his winger into dangerous areas. However, they only combined for two key passes in 2017, which happened in unlikely scenarios. Within minutes of each play, Feilhaber had two freekicks from similar areas that were met by a Blessing shot, both of which were stopped. If LAFC are expecting the SKC duo’s chemistry to light up the pitch, they will need more than just freekicks to one of the smallest players on the pitch to produce goal-scoring opportunities. LAFC also utilized the Expansion Draft to take the former San Jose Earthquake forward Marco Urena, who netted the ball five times (6.37 xG) in 2017. While those numbers aren't overwhelmingly impressive, it is important to factor in that that Urena played 1,812 minutes and also had 2.44 xA and 2.64 xB. The below shot maps shows Urena’s 2017 shots for San Jose where he shot 0.1301 xG/shot, meaning he took his chances from good positions (with one clear outlier at midfield). On the defensive side, LAFC have acquired starting level quality from several MLS teams. They’ve added MLS veteran left back Jordan Harvey, Belgian international Laurent Ciman, USMNT player Walker Zimmerman, and MLS Cup-champion Steven Beitashour. In terms of successful defensive actions per 96 minutes in 2017, Harvey made 3.89 while Ciman, Zimmerman, and Beitashour made 4.72, 4.05, 2.80, respectively. Lastly, LAFC added Seattle Sounder backup 'keeper Tyler Miller who only played one game in 2017. However, at 24-years-old, they have an average but consistent starter for years to come. Elsewhere, LAFC have added some depth with MLS players Aaron Kovar and Calum Mallace. I wouldn't expect these two to be difference-makers, but with LAFC’s 20-man roster, they add needed depth and some MLS experience on the team will be beneficial. Now let’s move on to some of those headline signings despite the lack of data. LAFC’s first and arguably biggest signing was Mexican international Carlos Vela. The forward has 18 goals in 63 caps with El Tri and bagged goals for Real Sociedad and Arsenal both in their domestic leagues and in the Champions League. Also thanks to Paul Riley’s Build-Your-Own Expected Goal Model, we can look back to the 2011/12 season at Real Sociedad to measure the quality of chances Vela took. Overall, I found that Vela’s shots were at 0.28 xG/96, which is pretty good considering that he was playing in one of the best leagues in the world. The table below has Vela's production by season. LAFC have also signed the young Uruguayan forward Diego Rossi. I don’t have any basic xG for his time in Uruguay’s top division, but he did score 13 goals in 46 appearances and is hailed by many as a top talent. They have also added young Colombian defensive midfielder Eduard Atuesta who will likely see the pitch next to Feilhaber and beneath Vela. The Black and Gold have also added Omar Gaber on loan from FC Basel who will add versatility as he can play right back or defensive midfield. Additionally, LAFC have brought in forward Rodrigo Pacheco on loan while inking a pair of Canadian internationals in Mark-Anthony Kaye and Dejan Jaković, who have both played in the US before. Lastly, LAFC have utilized the SuperDraft with their #1 overall pick going to Joao Moutinho (no, not that Joao Moutinho). Nevertheless, Moutinho was a top talent from this year’s draft, scored in preseason, and will certainly be competing with Harvey for the starting spot at left back. They also used the #3 pick overall to select Tristan Blackmon, who will offer good depth behind Urena. It’s likely that Bradley will deploy either a 4-3-2-1 or a 4-3-3 with a similar shape though I’m not sure what style of play this team will have. For goalkeepers, they have the choice between Miller and Honduran keeper Luis Lopez. The backline will likely be former-MLS player heavy with Ciman, Zimmerman, and Beitashour likely to start given they are all healthy. Jaković and Gaber currently offer the only depth for centerbacks and right back, respectively. At left back, it will be a choice between Harvey and Moutinho with the later likely to get the nod. In midfield, expect Feilhaber to be deep-lying and pulling the strings as he plays alongside the defensive-minded Atuesta. Above them will be Vela who, as an attacking midfielder, will hopefully spark his wingers in Blessing and Rossi. There isn’t a whole lot of depth in midfield, which will be a common theme in many positions for LAFC. Mallace, Kovar, Kaye, and Gaber are LAFC’s options for subs and during injuries; the notable drop-off between the starters and their depth is certainly troubling. As a lone striker will be Urena with Blackmon and Pacheco backing him up. Depending on how exactly LAFC play, Rossi, Vela, and Blessing can play as forwards, but this leaves gaps elsewhere. With the extremes of Atlanta’s and Minnesota’s 2017 campaigns going well and not-so-well, it’s hard to gauge how expansion teams will fare in MLS. LAFC have without a doubt brought in great players, but it is also no secret that they haven’t added enough players. I think their lack of depth will hurt them during the season as they try to figure things out. The Western Conference has gotten stronger this offseason and I can’t see this team getting into the playoffs. A finish of 9th-12th seems mostly likely.